Nathanael Greene had asthma, walked with a pronounced limp and belonged to the pacifist Quaker religion. None of that stopped him from becoming a national hero doing some of the toughest jobs of the American Revolution. His brainy tactics against the British in the South helped cement the American victory at the Battle of Yorktown. Nathanael Greene once explained the secret to his success: "We fight, get beat, rise, and fight again," he wrote. In 1780, American hopes for southern victory over the British lay in tatters. Congress, quarreling with Gen. George Washington, had ordered his rival Horatio Gates to take charge of the fighting in the South. Gates had made a mess of it. He lost his army (and his reputation) in battle with British General Charles Cornwallis at Camden, S.C. The loss permanently stained Gates’ record not simply because he lost, but because he lost 1,000 troops in the process. He also lost most of his army’s supplies in a badly managed retreat. Gates was one of three generals Congress had sent south who got thumped by the British. Furthermore, he had given at least tacit approval to a conspiracy to oust Washington (for which he later apologized). A frustrated Washington watched in dismay as Congress gave over the southern theater of the war to his rival. Contrite and embarrassed, Congress finally turned back to Washington and asked him to direct the war in the South. Washington turned to his Rhode Island general, Nathanael Greene, to once again handle a dirty job. Greene had taken over as quartermaster during the dismal winter at Valley Forge and managed camp affairs – much to his disappointment. It was a largely thankless job and he got little thanks for it – other than from Washington. In moving south, Greene now faced the challenge of taking on Cornwallis’ superior force. In addition, the country was beginning to question whether it could ever succeed in evicting the British. Nathanael Greene was a self-taught soldier. A member of one of Rhode Island’s leading families, he had stocked his library with many books on military leadership and tactics. His ferocious opposition to the British would earn him a rebuke from his fellow pacifist Quakers. But Greene persisted in his studies. In 1774 Greene helped organize the Kentish Guards, an army in Rhode Island, to prepare for war against Britain. He was only allowed to serve as a private because of his limp. Following the Battles of Lexington and Concord, the Rhode Island Legislature appointed Greene a general and sent him to Boston to join in the fighting. Nathanael Greene honed his administrative and battle skills fighting under Washington in Massachusetts and New Jersey. Washington now viewed him as one of his most able and trusted men. In the Carolinas, Greene began engaging in a game of cat and mouse with Cornwallis. As Cornwallis advanced, Greene retreated. What may have looked like cowardice was part of Greene’s strategy. He wanted to pull Cornwallis as far as he could from his main supplies in Wilmington, Del., to make it as difficult as possible for him to supply his army. He also wanted to find a battlefield that would give every possible edge to his greener troops. Greene had ordered Gen. Daniel Morgan, a battle-tested soldier, to harass the British, and Morgan was a happy victor at the Battle of Cowpens in South Carolina in January of 1781. Morgan’s victory was a tactical stroke of brilliance. His militia, he knew, would break and run as the British advanced if he asked it to hold the field. Instead, he told his militia, they would be placed centrally to draw the British soldiers who would see the weakness and attack. All Morgan asked was that his militia fire two volleys – an assignment they could manage – and then retreat to the side of another line of soldiers and reform there. The British took the bait. As the militia broke and ran, the British assumed a full retreat was under way. As they rushed forward, the American lines reformed and won a decisive and embarrassing victory. Greene, meanwhile, kept retreating, separating his army from Cornwallis by the Carolina rivers so prone to rapid rises. He wanted to keep Cornwallis expending as much energy as possible, all the while assuring Washington he would soon stop his retreat. Finally Greene arrived outside Guilford Court House in North Carolina. Here he offered to make a stand in March of 1781 against Cornwallis. The British general happily accepted. Nathanael Greene employed similar tactics to those Morgan used. Though numerically superior, the Americans had little training, and the British took the victory. The cost, however, was out of proportion to the victory gained. While they won the field, Greene’s choice of battle site kept his losses to a minimum. His position made best use of his sharpshooting American forces while rendering British artillery less effective. The battle of Guilford Court House was a Pyrrhic victory for the British. Furthermore, the two battles of Cowpens and Guilford Court House made it virtually impossible for the British to recruit local troops to support the regular army. The dispiriting battles set up the British for their final defeat at Yorktown. Nathanael Greene, the limping Quaker, returned to a hero’s welcome in Rhode Island. He didn’t stay long, however. The South Carolina government had voted him a large reward for his services. He settled in Georgia with his family and established a large estate. Nathanael Greene died at 43 in 1786, only three years after the war ended. But his reputation was firmly established as one of the ablest soldiers in George Washington’s army. 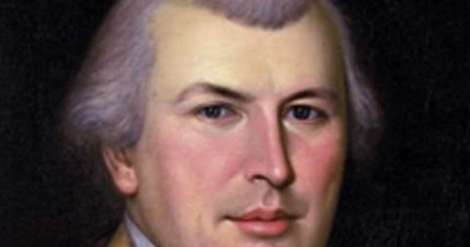 This story about Nathanael Greene was updated in 2019. I’ve always loved Nathanael Greene 💘. All of my Quaker ancestors in RI chose not to fight but they still supported the patriots in other ways. Gen. Nathanael Greene settled in GA and Eli Whitney invented the hand cranked cotton gin for his widow . Thank you for helping to keep Gen Greene’s memory alive! This is great. I have gained a lot more pride as an adult for this man and applaud all efforts to keep his name and homestead alive. I have a friend from the South who went to Nathanael Greene high school and said he is revered as a hero there. As we often do I took for granted the landmark in my own home town while living there and now have more appreciation for it and what it stands for having been away for decades. I have Two Ancesters who were from Rhode Island that fought in the Revolution on my Mothers Father’s side of the Family. Maybe they fought under General Greene? They settled in Kentucky after the War.